2019 World of Concrete – North TX International Concrete Repair Institute, Inc.
ICRI offers $25 Exhibits-Only Admission Online only* and discounted seminars to World of Concrete, January 22-26, 2018, Las Vegas, NV, USA—the industry’s largest annual education, exhibition, and certification event. Register using code promo code A36 by January 10, 2019 and save! Share this code with your colleagues*. Make plans now to attend and stop by the ICRI booth to meet and talk with our helpful staff. They will share information on all the latest news and exciting programs ICRI has to offer. See you in Vegas! 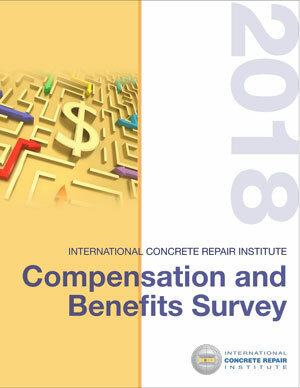 Compensation and Benefits Survey Results Now Available! Copyright © 2018 North Texas Chapter International Concrete Repair Institute, Inc. (ICRI) All rights reserved.